Provide a deeper and more complete explanation of many parts of our API. Although all the samples in this series will be in C# and use the .Net API, the ideas will apply to integrating to Sage 300 via any of our other APIs including COM, Java, XAPI, etc. Explore a number of newer .Net technologies and look at how these can be integrated to Sage 300. These may include things like LINQ and ASP.Net MVC. The goal is to start simple and then to progress to deeper topics. I’m sure I’ll have blog postings on other topics in-between, but look for this series to continue over time. I’ll be developing all these projects using the latest C#, Visual Studio and .Net framework. I’ll post the full project source code for anything mentioned. So to start these will be Visual Studio 2012, but I’ll switch to 2013 after it’s released. I’m also currently running Sage 300 ERP 2014, but these examples should work for version 5.6A and later. When you use the Sage 300 .Net interface you can’t share any objects with Sage 300 COM objects or ActiveX screen controls we use in our VB6 programming framework. If you want to use any of the COM/ActiveX controls then you must use the Accpac COM API. When you use the .Net interface you don’t have any interoperability with the other VB6 related technologies. From .Net you do have full access to our COM API via .Net’s COM Interop capability. Generally this is ok. If you are integrating a .Net product or writing an integration to something like a Web Server then you don’t want any of this anyway. But to just point this out up front. That you cannot use a .Net session object anywhere in a COM/ActiveX API. The COM/ActiveX session object is something that is similar but not interchangeable. Some versions of Sage 300 have included the help file that contains the .Net interface reference manual. However this isn’t universally available. To help with this I’ve put a copy on Google Drive for anyone that needs it, located here. Note that when you download help files over the Internet, Windows will mark them as dangerous and they may not open, to get around that, have a look at this article. Of course within Visual Studio, since our API is completely standard .Net, you will get full Intellisense support, so Visual Studio can give you a list of property and method names as you type along with giving you the argument list for the various methods. I’ll make the projects that are described in this series of blog posts available here. The one for this article is WindowsFormsApplication3 which then reminds me I should fill in the dialog box properly when I create a new project. There is additional documentation on our DPP Wiki, but you need to be a member of the DPP program to access this. First you must have Sage 300 ERP installed and you not have de-selected the “Sage 300 ERP .Net Libraries” in the installation program when you installed the product. Then after you create your Visual Studio project (of whatever type it is), you need to add two references: ACCPAC.Advantage.dll and ACCPAC.Advantage.Types.dll. Both of these will have been installed into the .Net GAC. It’s usually worth adding a “using ACCPAC.Advantage;” statement to the beginning of source files that access our API, since it saves a lot of typing of ACCPAC.Advantage. Now you are ready to use the Sage 300 ERP API. In this first articles I’m going to create a simple .Net Windows Forms C# application, put a button on the form and on click exercise various parts of the API. Nothing exciting will happen but we will print out some output to the console to see whether things are working. I talked a lot about creating sessions in this article, mostly from the COM point of view. Now we’ll recap a bit, but from the .Net point of view. The first thing you need to do when using our API is to create and initialize a session object. At this point you have a session that you can use. For our purposes here session.Init is very important that it is called and nothing else will work until it is called, but the parameters aren’t that important at this point. We’ll come back to them later, but you can just use the ones in the above example for most purposes. Although we aren’t signed on yet there are still some things we can do with the session object like get a list of the companies, which is something that is required to build a signon dialog box. Notice that the session’s Organizations property is a standard .Net collection and as a result we can use any C# language support for dealing with collections such as the foreach statement shown. Generally in our API we’ve tried to make sure everything is presented in a standard way for .Net programmers to use. Another very useful collection on the session is the Errors collection which is a collection of all the error messages (including warnings and informational) since it was last cleared. We’ll cover the usefulness of the Errors collection in a future article. Basically you need to provide the same sort of information that a user would sign-on to the desktop. Note that although the user id and password are forced to uppercase in the desktop’s sign-on dialog, they are actually case sensitive at the API level, so you must enter these in upper case. Also note that the session date is given as a standard .Net date type. Now that you are signed on, you can start to do more things. We can now start to access the database. This API was created before we duplicated the system database into the company database, but from the session you can get at some old system database tables like the currencies (which are now read from the copy in the company database). But to really start using the database you need to create a DBLink object from the session object. To do this you specify whether you want a link to the company or system database (which will pretty much always be Company now). Plus you specify some flags, like whether you need read-write or read-only access. Now that we have a database link we can directly access some things like the company information, fiscal calendars and the list of active applications for this company. But the main use of this object is to open the Sage 300 ERP business logic objects which we typically call Views. So far we’ve only managed to open a session and start using a few basic .Net objects. But these are the starting point to any project so we needed to take a bit of time to set the stage for future articles. Next time we’ll start to create View objects from our DBLink objects and start to explore some View functionality. If you have any opinions on the coding style, the use of C# or any other questions, please leave a comment for the article and I’ll try to address them. Keep up the Excellent work, really looking forward to future articles in this series. Please zip examples in Drive, individual file downloads are cumbersome. Good point. I added a zipped version of this one and will continue to do that in the future. I love to read your blog. Thank you for sharing your knowledge with world. Have you tried to reading custom fields under A/R Customers under optional fields tab. Optional fields are always implemented as a detail view to the thing they are optional fields for. So AR0400 (ARCUSO) is a detail view to AR0024 (ARCUS). I’m just starting to talk about handling header/detail views, but will have more in future articles. Often macro recording what you are trying to emulate can help quite a bit. thanks for your great information , i want to ask you qustion i am creat macro that create order entry shipped and invoiced directly when i try it on test data its creat order entry shipped and invoiced but when i try it on another company and change item and everything its only create order entry not shipped and invoiced why this happened?????? Usually its something like a required optional field. You might try entering an order/shipment/invoice in their system to see what extra fields they require. Also be mindful of security in case the user you are running the macro as doesn’t have rights. Also have a look to see if there are any warnings or other messages in the sessions errors collection. i try ACCPACErrorHandler there is no error but what make me crazy the code on test company work but on the other company work but not shipped and invoiced. Hi I am new to using ACCPAC COM API. Our client has created a user name and password which signs onto the desktop app but gives us “user not assigned error” Any thoughts? HI,I Want to drag gl2100.ocx to winform ,but it popup message,Failed to import ActiveX control. Make sure it is properly registered.how ? This is usually caused by one of a couple of things. 1. There are a couple of bad versions of the .Net runtime, choosing a later version for your project often helps. 2. Data Execution Protection is turned on by default in newer Visual Studios, this is solved in our product in the newest product update for the 2012 version or using the 2014 version. would you told me your development environment? windows version(win7 or win2003 server 32bit or 64bit ) and Visual Studios version. I’m running Windows 7 64 Bits, Visual Studio 2013 and .Net 4.5.1.
i install new os(win7 64b sp1) ,accpac (accpac 6.1) and .net 4.5.1 ,but it still no work. but accpac fieldedit control and some dlls in accpac runtime floder can work. choose items–>com components–>choose accpac gl2100. Do you have the latest Product update for Sage 300 2012? This is necessary to work. On my sage system there is windows authentication.My User id n password which i provide is windows id and password and “IND09” is my database name which get from sql server object explore. My newbabie for all those thing please provide me guidance. 1.From where to take company id or database id in replace of “IND09”? 2.What to write user id and password when authentication is Windows Authentication? Hi I am also having the same problem to you. I dont know why i cannot login or Open sage session. Even my old project that used to open, Now all are cannot Open. If you use the open method then it will use the Sage 300 User Id. If you want to use the Windows credentials then you need to use the OpenWin method to open the session. Hi, I am using sage 300 as above code, but i still cannot login. Could you advise me? incorrect procedure .you cant edit this company while sage 300 erp is signed in exit sage 300erp and retry. To get into database setup you could reboot to kill anything still running (or start taskmgr and kill any a4w* processes). One thing for 5.6 is that the .Net libraries were optional in the install and you needed to select them, perhaps they need to be added in this case. Can you run the normal UIs? These use the same methods. Are you entering the user id an password in upper case (it is case sensitive, even though the desktop upper cases these)? Perhaps use COM Spy (or Accpac Spy) to spy of the session objects to see if it gives a clue as to what is going on. Can you give me the Error? maybe i used to have and solved it. Have you tried putting an exception handler around it and checking the session.errors object to see if there is a string error message? this message now appear : system error write down the message ,error and source codes .exit 300 ERP and windows .restart and retry the operation. is the reason coz i install 6.1 on my pc and try to remote 5.6 pc from my pc ????? and in the setup screen when i try to edit DAT company this message shown : Incorrect procedure . you cant edit this company while sage 200 signed in exit sage 300 . We don’t support installing multiple versions at once. We only support one version installed at a time. i have one more point about database i want to add trigger on table after insert record i want to change some value is this good ???? i can make my trigger on DB of ACCPAC with no effect on ACCPAC system work ??? This is really very bad. It can cause all sorts of problems with weird errors and corrupted tables. Please only change our database using the View API. but stephen i want to make triggers on the database to change optional fields values only and the status field is this bad too?? i don’t want to change critical fields. The problem is that triggers lead to very hard to diagnose problems. If your trigger fails, the Sage 300 ERP transaction that initiated the trigger will fail and be rolled back. The error reported will be completely cryptic. Then will call support who will run RVSpy/DBSpy which will see nothing. I tried downloading the API Ref help file from the google drive link. But when run, it only showed me the properties/ methods (left panel) without the help content (on the right windows). So sorry, did I miss out anything. A great thanks. Its work perfect. I tried to create a custom FEC, type “DatePicker”,. The field is initialise to a ACCPACCustomerField and displayed on the form. But it is displayed as a “Text” nature, the “icon for date/time picker” is not there. Sorry, did i missed any setting ? I am looking for a programmer who can create a basic asp.net based project which can talk to Sage300 and create/edit employee information. If interested please contact me at mattd@amviksolutions.com. Hi Smith, I just read your blog.I have a question. Now i’m in project build a software from vb.net to integrate with accpac. I did the part from Vb.net to export file. But i’m still confused, how to import that file to accpac. Can I dirrectly import the file to accpac? or should I open the accpac first and then import the file? Any suggestions to make my concept better? Please i need your help. For the import/export built into the product you can use the COM AccpacImportExport COM object and call ExecuteImportScript or ExecuteExportScript (you need to save the script from the product’s import/export). You can also use the .Net API if you process the import your self, ie code reading the file and then use the API to insert the data into Sage 300. So,let’s say I need to build the accpacimportexport in vb.net code? 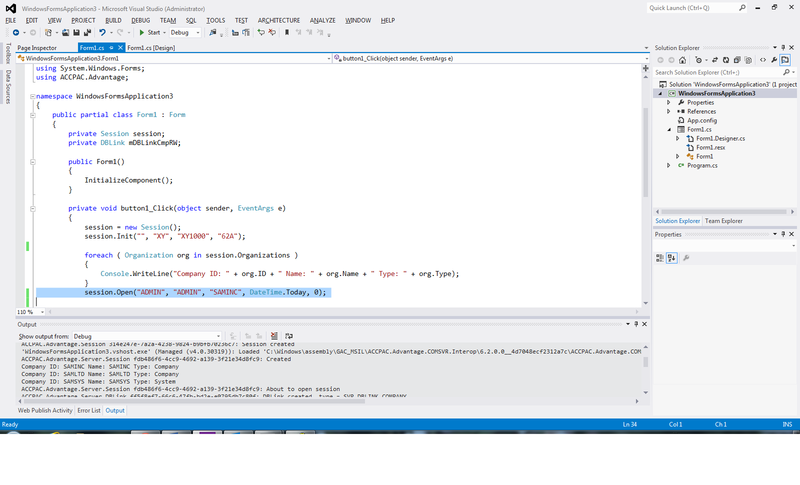 The problem is my column name from database to export in vb.net, are not same like column in accpac. Should I synchronize the column header? but how? Sorry I’m newbie to use the accpac & vb.net. That’s one of the things saved in the script. When you go into the export or import from the product you can map the fields. When you save the script, it saves this field mapping. This will then be used when you execute that script. I have a queries. I am doing a VB code where I insert the ActiveX screen control onto my program. 1. How can I disable any prompt generated by the UI. Example, in I/C Shipment there is a prompt for “Negative shipment prompt when quantity is below on hand”, or a “Confirm to delete” prompt etc. I need to disable is because my coding is dong some auto insert/delete of the detail based on user action. 2. I inserted a fec linking to the document no. I notice I can’t use the fec finder, there is always a error when user select a transaction no from the fec. It is because there is a “INIT” action auto return in the fec after user select a document no. 1. Some UIs have extra properties that you can set to disable prompts, like O/E Order has to disable printing of order confirmations. I don’t think this UI has this, but you can disable this check in I/C Options. 2. It might be you have to handle the OnKeyChanged event as below. Otherwise its something to do with how you configured the finder in its properties dialog. Hi Stephen, great articles, thank you! Are similiar .NET api’s available for “Sage 300 Construction & Real Estate” application as well? If this is the same thing, I am sorry. Sage 300 CRE is a very different product than Sage 300 ERP. Sage 300 ERP is a descendant of the Accpac ERP product and Sage 300 CRE is a descendant of Timberline. I’m not really sure what API or SDK have, you would need to contact their support department to find out. Thanks for some great articles! I had one question – you said that you can not use the AccPacCOMAPI class along with the AccPac.Advantage classes. I notice that the DBLink and Session classes do not have Close() methods but the COMAPI objects for sessions and db links do. If this is the case, does that mean you can not close the Advantage objects? Or is there a way to access them via their COMAPI “siblings” to access the ability to close open sessions and links? In the .Net API you have to call the dispose() method to close them. I have an issue when attempting to retrieve or insert data into SAGE databases using the SDK 61A. I am able to establish connection with the SAGE database and open the Views. However, I am getting a HRESULT E_FAIL error when I try to retrieve or insert data into SAGE 300 2012. The error is thrown when when executing the highlighted line. I tried with both SDKs 61A and 62A wth same result. Have a look at this article: https://smist08.wordpress.com/2013/12/06/error-reporting-in-sage-300-erp/. Chances are there are descriptive messages on the session’s error stack that will be more helpful. I have to specify a SessionID, here the 1 is SessionID . The should be there. They are installed to the GAC so they are usually in both the runtime folder and the GAC. If you don’t see them try running runtime\smdotnet.exe to see if it wants to install them (if it offers to modify or remove then they are already installed). I am new on sage SDK, Pls help me on switching from one company to another. I have logged-in into a database X, simultaneously i want to access a table ABC from Database Y.
i read few blogs on DBLink, LnkOpen i am not clear on that, Pls request your help on this. You will need to call lnkOpen to open a link to company y and then open any views that you want on company Y using viewOpen with this link (after calling viewLoad). This is fairly easy as long as the modules you need are activated in both company X and Y. If you use the COM API then you can clone a given session to get a session to another company. I have coded using lnkOpen and viewOpen to access table OLORDLEH from DB DEVDAT i have logged-in into SAMLTD database,But i am unable to initialize the view, Working code as given, Pls help to find where i am going wrong. I doubt going wrong in linkno. as i am going further i got error on calling viewInstanceOpen, As my code below…. Its just saying there is no flags element in cmpNameList[CMP_OLACCAUH_OLORDLEH] (which is just a view composite name). Check rotoview.h for the flag values for this function. I have logged in to SAMLTD ORGID, while calling lnkOpen how to get (LPByte) ORGID for DEVDAT which is another company. What you have there looks like it should work. Using “DEVDAT” for the field is fine. Check what the value of e is on return and compare it to the returned values in lnk.h and dbs.h to see what is wrong. Also you can try running DBSpy as it might give you a hint also. before calling lnkopen, do we have to call any other function to obtain link to another organization. You shouldn’t. I think you need to find out the exact error number. If the error isn’t 0 then the number will tell you what is wrong, just check it against the include files. Running DBSpy will also probably tell you the error number to look up. Do i have to use lnkOpen or DBlink for above requirement, Pls correct me if i am wrong. Are you sure you can sign into this company using the desktop? It sounds like this company isn’t in your Database Setup? When i linked same system database to multi DAT database then this issue is resolved. if i share same SYS database for multi DAT database is there any collusion between DAT databases.If yes what are the scenarios pls let me know. The main thing is that when companies share the same system they can synchronize their currency rates and security groups, saving you entering the same things into each of them. I have two Sage 300 organizations. I can see licenses are correctly setup for both of them, but, for some reason, on the second one I cannot see most of the modules. Did you activate the modules for the second company in Admin Services – Data Activation? The desktop only shows the modules that have been activated for a company. Make sure you supply the correct User ID and Password. Although, I am pretty sure of the User ID and the Password because I am able to read from the database from Php code under a PDO connection using the same user ID and the same Password that I am using to open the session. Stephen nevermind I just fixed it, the username and password had to be in CASPLOCK if someone else has the same problem. I’m having a problem logging in from the API. With the same credentials, I can log in from the UI. Is there a way to enable/disable API access? Remember the API is case sensitive, so make sure you have them all in upper case. The only way to disable the API is to un-install it. You could always run the installer to ensure its installed. Yes, I know that so I’m passing username, password and organization ID all in upper case. _FAIL has been returned from a call to a COM component. Not too sure. You could try running COM Spy on the Server Session to see if it tells you anything. If you have more than one version of Sage 300 installed, it could get confused as to which DLLs to load (make sure you don’t have multiple runtime folders in your path). It is not clear for me what do they refers. Anyway, once I opened a session and logged in to an org, what if I want to switch and log to a different org? Do I simply have to open the new db link? I don’t see any method for closing the previously opened link. Use session.clone to get a session for another company. After I cloned the session I have to open a new db link, right? How do we close the Sage session and the db link? I’ve tried the code you provided…. But no matter what I do I get “Invalid Signon Information.Make sure you supply the correct User ID and Password.” error. I know that I’m providing the correct username and password since it works in using sage 300. I know I’m providing the correct company ID since I can see it in the org loop. Note that this info is case sensitive in the API, so since the UI uppercases these, you have to provide them in upper case to the API. Perhaps try running the accpac\runtime\regacc.exe program. Also try running a macro, make sure those are working. Do you have multiple versions of Sage 300 installed? This can cause problems of this nature. I’m having some troubles updating some fields in the Customer view. I set them with the verify flag equals to true, then I also call the verify method. When I call the update I got no error but from the UI the fields have not been updated. Hi Stephen, was wondering if you are open to freelancing and help us get the api working? Sorry, but I’m doing other things these days. I’m sure another Sage 300 business partner or development partner could help you. I’m getting a strange error while updating some fields in the Customer view. I’m setting the value with the verify flag set to true and I get no error. I also call the verify method and I get no error. I call the update method and I get no error but in the UI the fields are not updated. Do you have any idea why is it happening? If the fields are actually in a detail view then you need to update the detail, then update ARCUS to commit the changes to the database. Also ensure you read the correct record before updating it. Thank you Stephen. Is ARCUS the header view? I’m updating that one. I have successfully implemented the API using Sage 300 2016. One of my implementations now fails on Sage 300 2014 with the following error: HRESULT E_FAIL has been returned from a call to a COM component. Can this be due to the older version of Sage 300 ? Are the methods calls in the API backwards compatible ? Hope you have a great 2017 ! They mostly are compatible, as are the views. I suspect you need to run your program in the debugger to see what line it failed on. A common cause is a client not having an expected module activated or some other data difference (perhaps being multi-currency or something). Hi, dont know if this will still work but let me try. If I want to dev, how do I connect to the MSSQL db without having Sage300 installed on the machine running the program? the program will pull invoices and write orders into the Sage DB. But nowhere can I see where I open a connection to the DB on another server? The actual connection string? How do I tell the AccPac.Advantage where the DB is in the Cloud? To write data into the Sage 300 database, you need to use the Sage 300 business logic to do this. So you must have at least workstation setup run on that machine. If you write data into the database using something like ODBC then you will likely corrupt the database and cause all sorts of problems down the road. For reporting purposes you can read data directly via ODBC, but not to write data. You must use the API to add your invoices and orders into the system. An unhandled exception of type ‘System.AccessViolationException’ occurred in Unknown Module. I get this error when i am trying to open the session. Its the same code as you open the session in samples only change is userid, password and companyid. All are in caps as i see its case sensitive..
Is this error of .net or something related with sage dlls connection issue while integrating. Any word on this Stephen? Don’t know what it would be. It could be you multiple installations of Sage 300? I suspect some sort of DLL conflict problem. I took your sample ARInvEntry from google drive. Just changed the login credentials for session and company id. And i am getting this error. Is there anything else i need to change, if i missed something that cause this issue. from where i can get the AppID, Program Name, and Appversion? I have got the AppId and Program Name. But i am getting an error when i am trying to open a session using credentials. With the same credentials i am able to open AccPac ERP. Hi Amit, Try to send your password in caps..
Its done by passing passwords in CAPS. I have a query regarding order details integration. HI,I Want to drag OE1100.ocx to winform ,but it popup message,Failed to import ActiveX control. Make sure it is properly registered.how ? I’m a newbie to Sage. Quick question, how do I log into a Sage 300 system across a local network? Typically you would do a full install on the server, and then run the workstation setup installation on each computer you wanted to use on the LAN. This will set everything up so you can log in. Very new to Sage 300, need a few inputs. We’re currently in the process of integration Sage300 with Dynamics CRM. We have an instance on Sage 300 running on AWS. 1. What are a few things, I need to put into the consideration before getting started. 2. Do I need to have a Database instance for the integration to happen between CRM and Sage 300. If you are writing data into Sage 300 then you need to use an API such as the .Net API. If you are just reading data then you could consider just going to the database directly. You don’t need a separate database instance, usually things work faster without one, until you reach a certain number of users then it helps. There are some 3rd party integrations such as from Starfish or eBridge. It largely depends on what you are trying to do. Exception Details: System.Runtime.InteropServices.COMException: Invalid Signon Information. The error sounds pretty specific. Did someone change a password on you? Perhaps the account is disabled for some reason? Did you try logging on to the desktop using the same credentials? I think you’ll have to use COM Spy to spy on the various COM objects to see what is really failing and perhaps get a clue as to why. Also you could try using regacc.exe to unregister all the Sage 300 COM objects and the re-register them, that sometimes fixes things up. How to use COM spy?? I don’t know about this.Can you help me please??? There is a limit to the number of dblinks (perhaps 256, I don’t remember). When these run out you get this message. Usually this means you have a leak in your program, you are opening links without closing them. In .net there is GetSchema() method on DbConnection, to get tables, columns, primary keys and many other schema info for the selected connection. Now I need to get it all connecting to Sage300CRE database also. Using the Api, is it possible to get all these Schema information? My experience was with Sage 300 ERP (formally Accpac). I don’t really know much about CRE (formally Timberline). Sorry. You can download the code associated with these articles. Have a look at these. Thank for the wonder full information. I am new to Sage 300 integration as well. Is there document covering ACCPAC.Advantage C# syntax or commands needed to integrate with accpac tables. Few are mentioned in you beautiful presentation. But is there comprehensive document? I found all the info needed in your shared materials. But i can find the advance dll ‘s in the run time folder for referencing?? .net libraries were installed? Hello, I have a question as follow: I have developped a C# web application which is working fine on the server side but, when i connect using the application link from another pc, I am unable to open accpac session although the client PC is running Accpac normally on their local machine. Please advise on what could possiblybe the problem.